subroutine Look at the top card of R&D. You may add that card to the bottom of R&D. Sneaky: Due to the high danger of hand loss when running on face-down Jinteki ICE, a great many Anarch and Criminal runners without access to Self-modifying Code will attempt to find and install their Killer before checking unrezzed ICE. Yagura is a Code Gate, which when deployed in-faction means that it's subroutines have a very good likelihood of firing when first rezzed due to the misdirection that the threat of Komainu and Tsurugi present. Efficient: Has a high Break-to-Rez cost ratio (2:1) against nearly all standard Decoders, meaning it is economically very effective for the price should the runner wish to break it's subroutines. Fortunately, Yagura's subroutines are excellent and will very often demand this price. R&D Defense: The first subroutine when deployed over R&D can actually be just as good as an "End the Run" if not sometimes conditionally better in the early game (prior to RnD multi-access capabilities coming online for the Runner). This is largely deck composition dependent, as Yagura works best in a Jinteki deck with thorny assets that trigger from RnD (Shock!, Snare!, sometimes Fetal AI depending on the score state). When the first subroutine fires, the corporation gains a chance to bury a trashable Asset or stealable Agenda and effectively "Re-Roll" the top card of their deck, hopefully coming up with something the runner cannot effectively deal with or that will punish their hubris. Additionally, a low-level mind game ensues every time that the corporation chooses to leave the card on top of R&D. This can even occasionally make seasoned Runners flinch and back off, allowing you to keep a card that you want to score or install despite them having the capability to trash/steal it (this technique for true Jinteki masterminds only). Having at least 4 credits in the corporate bank and a rezzed Yagura that cannot be broken over R&D is a flashing Keep Out sign for most runners. Deck Filtering Utility: The first subroutine, when placed anywhere else BESIDES your R&D that the runner will want to go often, is a much subtler effect that may sometimes go unbroken by Runners who think that they aren't hurting themselves. The subroutine transforms itself from defensive to utility in this circumstance, allowing you to scry next turn's mandatory draw and roll up a new card if what you see won't directly help you at your current stage of the game. This is an insidious ability that smart runners will often pony up the credit to stop you from having when they run through Yagura, creating a win-win economic scenario for the Corporation. Painful: Cheap, recurring net damage like the second subroutine of Yagura is a terrible thorn in the side of a Runner, very often translating directly to click loss as they seek to replace lost cards. When combined with other forms of tick net damage (Trap assets, House of Knives counters, the ID ability of Black Tree Jinteki, other Yaguras stacked in multiples...) this will dissuade runners from accesses and slow their game considerably. Some less savvy runners will think that Yagura's lack of an ETR subroutine and the survivability of it's single point of net damage effect means that they should run through it over and over again in the early game if it's the only card defending a central server. This is a huge mistake as the attrition damage of Yagura will snipe valuable pieces of their game-plan out of their hands and force them into damage control turns, giving the corporation the cumulative effect of a Time Walk down the line. Irritating: Common methods of ICE destruction or mitigation such as Parasite, Emergency Shutdown, Femme Fatale, Knight, and most recently Spooned are heavily discouraged by how cheap and (relatively) inoffensive Yagura is. 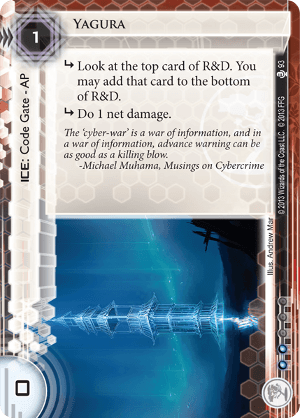 This ICE's subroutines and rez cost are at a perfect juncture where they cannot be safely ignored but are not major enough to prompt the runner to burn their power cards against it, and often are a huge swing in tempo when the runner IS forced to use such cards. Deck Composition: As alluded to in the R&D defense bullet point above, the first subroutine of Yagura really shines best in a Jinteki deck that includes many thorny and/or hard-to-trash assets. Fortunately the red faction has plenty of ways to make the going tougher for the runner even on the cards that they DO access. Jinteki: Personal Evolution can use Yagura to feed Fetal AIs to the runner for 3 net damage, and Industrial Genomics: Growing Solutions may benefit from their ID ability to harden R&D against accesses by making the Assets and Upgrades of their deck too economically punishing to trash on access. With the first subroutine of Yagura you want to be taking your chances by sending the topmost card to the bottom of R&D as little as possible, and having a deck that plays to that by usually showing you something you want the runner to see the first time can be very advantageous. Splashability: Yagura is an amazing piece of ICE design that offers a great deal of play in Jinteki, but a pricey 2 influence is actually the least of it's problems when considered as a splash out of faction. Almost all of Yagura's singular strengths depend on synergies within the faction, and the 2 influence cost for such a small piece of ICE makes it very uncomfortable fighting against Quandary and Pop-up Window which are much more general-duty small Code Gates. Yog.0: When Fear and Loathing arrived Yog.0 was still considered the pinnacle of Code Gate breakers (due to a lack of high-strength code gates with effective subroutines aside from common Femme-target Tollbooth), and yet Yagura saw a great deal of praise and play even then. Working as a deck's single Code Gate within natural Yog.0 range Yagura is fortunately so cheap that it is at least a temporary tempo success anytime the Runner is forced to fetch their Yog.0 in order to deal with Yagura's subroutines. 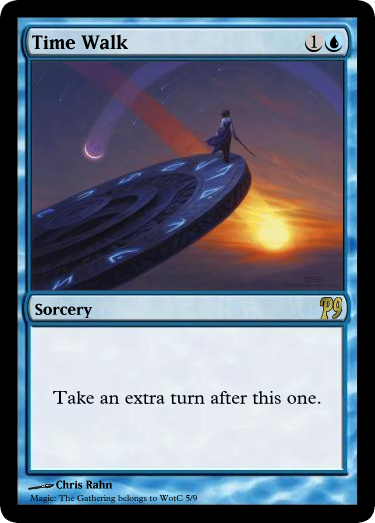 Now that the Code Gate card pool has matured, the meta has stabilized to a point where Yog.0 is quite rarely seen outside of Anarch, and Yagura is free to tax runners for 2 credits every time they want to see an unspoiled card from the top of the corporate deck. However, the free subroutine break of Yog.0 is a very tempting efficiency and so that icebreaker is unlikely to ever completely go away. For this reason Yagura pairs quite well with Lotus Field to create a High/Low Strength code gate power combo that is generally quite resistant to Yog.0, all in-faction. As a note of comparison, consider Pup, a Jinteki Sentry of equal rez cost to Yagura. Pup is not at all a bad piece of ICE (anything that compares closely to Pop-up Window likely isn't). While it's possible to argue that Pup is more broadly useful in a deck that isn't built to synergize with the R&D defense effectiveness of Yagura, I would personally never consider including a single Pup in a Jinteki deck before I had already included all 3x Yagura I had access to. Yog.0 and Parasite: ARE NO LONGER CARDS. This is a massive boost to the playability of Yagura, and it should be noted that Yagura saw a good amount of usage even when they were available. Sneaky: Due to the high danger of hand loss when running on face-down Jinteki ICE, a great many Anarch and Criminal runners without access to Self-modifying Code will attempt to find and install their Killer icebreaker before checking unrezzed ICE. Yagura is a Code Gate, which when deployed in-faction means that it's subroutines have a reasonably good chance of firing when first rezzed due to the misdirection that the threat of Komainu and Cortex Lock present. On the flip side Yagura's low strength means it can be easily handled by many popular AI breakers, so be sure to consider cards like Swordsman in order to punish such runners. Efficient: Yagura has a high Break-to-Rez cost ratio (2:1) against nearly all standard Decoders, meaning it is economically very effective for the price should the runner wish to break it's subroutines. Fortunately, Yagura's subroutines are excellent and it will very often demand this price. Painful: Cheap, recurring net damage like the second subroutine of Yagura is a terrible thorn in the side of a Runner, often translating directly to click loss as they seek to replace lost cards. When combined with other forms of tick net damage (for example, House of Knives counters) this will dissuade runners from accesses and slow their game considerably. Some less-savvy runners will think that Yagura's lack of an ETR subroutine and the survivability of it's single point of net damage effect means that they should run through it over and over again in the early game if it's the only card defending a central server. This is a huge mistake as the attrition damage of Yagura will snipe valuable pieces of their game-plan out of their hands and force them into damage control turns. R&D Defense: The first subroutine when deployed over R&D can actually be just as good as an "End the Run" if not sometimes conditionally better. This is largely deck composition dependent, as Yagura works best in a Jinteki deck with thorny cards that trigger damage when accessed from RnD (Breached Dome, Snare!, and Obokata Protocol are good examples). When the first subroutine fires, the corporation gains a chance to bury a trashable Asset or stealable Agenda and effectively "Re-Roll" the top card of their deck, hopefully coming up with something the runner cannot effectively deal with or that will punish their hubris. Additionally, a low-level mind game ensues every time that the corporation chooses to leave the card on top of R&D. This can even occasionally make seasoned Runners flinch and back off, allowing you to keep a card that you want to score or install despite them having the capability to trash/steal it (this technique is for true Jinteki masterminds only). Having at least 4 credits in the corporate bank and a rezzed Yagura that cannot be broken over R&D is a flashing Keep Out sign for most runners. It's important to note that permanently-installed "R&D Lock" cards like R&D Interface and Medium are no longer in the game which improves the value of this subroutine compared to the previous meta. Deck Filtering Utility: The first subroutine, when placed anywhere else BESIDES your R&D that the runner will want to go often, is a much subtler effect that may sometimes go unbroken by Runners who think that they aren't hurting themselves. The subroutine transforms itself from defensive to utility in this circumstance, allowing you to scry next turn's mandatory draw and roll up a new card if what you see won't directly help you at your current stage of the game. This is an insidious ability that runners will agonize over spending the credit to stop you from having when they run through a Yagura over HQ or Archives, creating a win-win economic scenario for the Corporation. Deck Composition: As alluded to in the R&D defense bullet point above, the first subroutine of Yagura really shines best in a Jinteki deck that includes many thorny and/or hard-to-trash assets. Fortunately the red faction has plenty of ways to make the going tougher for the runner even on the cards that they DO access. Jinteki: Personal Evolution can use Yagura to feed Obokata Protocols to the runner for a 5 net damage "opportunity" to steal when they know the runner is unable based on current hand size, Jinteki: Potential Unleashed gets bonus value from any net damage you manage to trigger from your deck, and Industrial Genomics: Growing Solutions may benefit from their ID ability to harden R&D against accesses by making the Assets and Upgrades of their deck too economically punishing to trash on access. With the first subroutine of Yagura you most likely want to be taking your chances by sending the topmost card to the bottom of R&D as little as possible, and having a deck that plays to that by usually showing you something you want the runner to see the first time is very advantageous. Comparison to Mirāju: Mirāju appears very similar to Yagura in base stats (cheap Str 0 Code Gate) and when building a deck you should compare the two closely. They fulfill very dissimilar functions however. Mirāju can help Jinteki defend HQ and deal with Agenda Flood but it's use cases are far more narrow then Yagura and it allows the runner to derez it if they're willing to commit clicks and credits to runs, which can be used in certain cases to make the corporation poor through sustained economic warfare (how often will you be willing to re-rez Mirāju?). I believe that Yagura is the more generally useful all-around low strength taxing Central server Code Gate, but don't be afraid to mix the two up to provide broad coverage central-server defensive value. Comparison to Pup: Pup is a Jinteki Sentry of equal rez cost to Yagura. Pup is not at all a bad piece of ICE (anything that compares so closely to Pop-up Window likely isn't), but I feel it's overvalued by many people. While it's possible to argue that Pup is more broadly useful in a deck that isn't built to synergize with the R&D defense effectiveness of Yagura, I would personally never consider slotting a single Pup in a Jinteki deck before I had already included 3x Yagura. The subroutines simply do not compare. Splashability: Yagura is an amazing piece of ICE design that offers a great deal of play in Jinteki, but a pricey 2 influence is actually the least of it's problems when considered as a splash out of faction. Almost all of Yagura's singular strengths depend on synergies within it's own faction, and the 2 influence cost for such a small piece of ICE makes it very uncomfortable fighting against Pop-up Window and Fairchild 1.0 which are much more general-duty small Code Gates available to the other factions.